Posted on Tue, Mar 13, 2012 : 4:30 p.m. 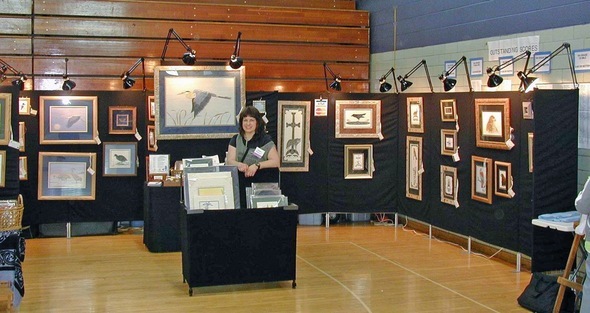 Artist Susan Falcone's booth from a previous Dexter Pioneer Arts Fair. What makes the annual Dexter Pioneer Arts Fair so special is that visitors have a chance to see the artists at work while browsing the artwork at the show. “I find the intimate setting of this small local show provides a great venue for interaction among artists, visitors and the (Dexter Area) Historical Society members and supporters,” said Susan Falcone, a longtime local artist exhibiting at the show. Falcone said she’ll be bringing some pieces from her new nature icon series that are unusual because of the combination of watercolor and gold leaf. This year will mark the 39th annual show featuring more than 50 artisans, who will also demonstrate their traditional and folk crafts. The art fair takes place March 17 from 10 a.m. to 4 p.m. at Creekside Intermediate School. Among the items for sale will be jewelry, stained glass, weaving, quilting, watercolors, wood carvings, toys and lace. There will be a craft table for children and a bake sale as well. “The Dexter Pioneer Arts Fair is a little spring gem,” said Rebecca Levenson, a fiber artist from Ann Arbor who exhibits there. 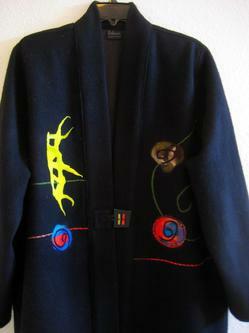 A black felted jacket made by fiber artist Rebecca Levenson. Levenson, who makes one-of-a kind jackets and scarves, said she’ll have silk screened Gingko scarves and beautiful hand-dyed silk scarves along with some new styles of jackets. She said artists donate 15 percent of their sales to the historical society. The money supports the work of the society and the maintenance of the Dexter Area Historical Museum. Tickets will be available for door prize items, which include soaps from Cynthia High, a wooden bowl from Mac Buxton, a pottery item from Pam O’Hara, and a hearth broom from Ron Lindgren. Admission is $3 for adults and 50 cents for students in grades K-12. For more information about the Pioneer Arts Fair or the Dexter Area Historical Society and Museum visit the society's website.